Cardiac output is the product of heart rate and stroke volume. Neonatal cardiac output depends more on heart rate than stroke volume; therefore, very high (>180 beats per minute [bpm]) and very low (< 80 bpm) heart rates are likely to compromise cardiac output if prolonged. However, not all infants with subnormal heart rates have impaired perfusion. At higher rates, ventricular filling time and end-diastolic volume are diminished, and myocardial oxygen consumption is increased. Because myocardial perfusion occurs during diastole, further increases in heart rate may produce undesirable cardiac ischemia, leading to ventricular dysfunction. Clinically significant alterations in preload, afterload, and contractility may be achieved by the use of vasoactive pharmacologic agents, administration of inotropic agents, changes in blood volume, or a combination of these methods. Blood flow to tissues and organs is influenced by their vascular beds, which are under the control of central and local vasoregulation, also referred to as autoregulation. This provides different organs with the ability to maintain internal blood flow over a wide range of arterial blood pressure fluctuations. When autoregulation is lost, blood flow becomes pressure passive, and this may lead to ischemic or hemorrhagic consequences. The biochemical mediators of vasomotor tone for each vascular bed are different, and their complex interactions are not yet fully understood. The ability of the blood to impart delivery of oxygen and nutrients and to remove metabolic excretory products is largely determined by adequate lung ventilation and perfusion, oxygen-carrying capacity, and oxygen extraction by the tissues. Although each gram of hemoglobin can bind 1.36mL of oxygen, fetal hemoglobin binds oxygen more tightly than adult hemoglobin and, thus, has a relatively reduced oxygen-unloading capacity at the tissue level. This results in a leftward shift of the oxygen-hemoglobin dissociation curve. Other factors that may cause a significant leftward shift of this curve frequently accompany shock and include hypothermia and hypocarbia. Under these circumstances, oxygen extraction by tissues may be decreased despite adequate oxygen delivery. Usually, mean blood pressure, rather than systolic pressure, is used to judge the normality of data obtained from the indwelling arterial line. Mean blood pressure is thought to be free of the artifact caused by resonance, thrombi, and air bubbles, but this may not always be true. Based on these data, the statistically defined lower limits of mean blood pressure during the first day of life are approximately numerically similar to the gestational age reference range of the infant. A low upper body blood flow is common in first day of life in preterm infants younger than 30 weeks' gestation; this has strong correlation with periventricular or intraventricular hemorrhage. Blood pressure measurement is limited to assessing the systemic flow, particularly in the presence of physiologic shunts; thus, the estimation of superior vena cava (SVC) flow is observed to correlate with the low flow states rather than the left ventricular output (LVO). The low flow states are also associated with hyperkalemia in premature infants. A linear relationship between blood pressure and both gestational age or birthweight and postnatal age is recognized; however, only preliminary data are available on the gestational age–dependent and postnatal age–dependent organ blood flow autoregulatory range and on the relation among blood pressure and systemic blood flow, cardiac output, and neonatal mortality and morbidity. Oxygen delivery to the tissues is influenced by cardiac output and blood flow more so than blood pressure; hence, values of blood pressure that are statistically abnormal are not necessarily pathologic. This is true for systolic, diastolic, and mean arterial blood pressures. Similarly, hypotension is not synonymous with shock but may be associated with the later stages of shock. 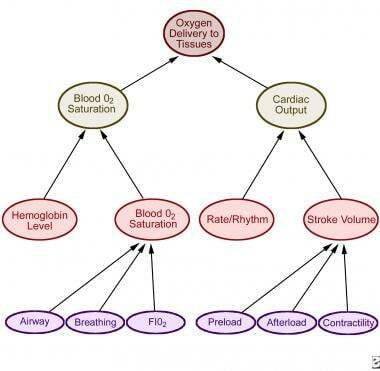 Determinants of cardiac function and oxygen delivery to tissues are shown in the illustration below. The liver and bowel may be damaged by shock, leading to GI bleeding and increasing the risk for necrotizing enterocolitis, particularly in the premature infant. Parents should be informed of the risk for neurodevelopmental handicaps as well as the need for intensive follow-up care for medical and neurologic problems. For patient education information, see Shock and Cardiopulmonary Resuscitation (CPR). Shock is a progressive disorder but can generally be divided into 3 phases: compensated, uncompensated, and irreversible. In compensated shock, perfusion to vital organs, such as the brain, heart, and adrenal glands, is preserved by sympathetic reflexes, which increase systemic arterial resistance. Derangement of vital signs, such as heart rate, respiratory rate, blood pressure, and temperature, is absent or minimal. Increased secretion of angiotensin and vasopressin allows the kidneys to conserve water and salt. The release of catecholamines enhances myocardial contractility, and decreased spontaneous activity reduces oxygen consumption. Clinical signs at this time include pallor, tachycardia, cool peripheral skin, and prolonged capillary refill time. As these homeostatic mechanisms are exhausted or become inadequate to meet the metabolic demands of the tissues, the uncompensated stage ensues. During uncompensated shock, delivery of oxygen and nutrients to tissues becomes marginal or insufficient to meet demands. Anaerobic metabolism becomes the major source of energy production, and lactic acid production is excessive, which leads to systemic metabolic acidosis. Acidosis reduces myocardial contractility and impairs its response to catecholamines. Numerous chemical mediators, enzymes, and other substances are released, including histamine, cytokines (especially tumor necrosis factor and interleukin-1), xanthine oxidase (which generates oxygen free radicals), platelet-aggregating factor, and bacterial toxins (in the case of septic shock). This cascade of metabolic changes further reduces tissue perfusion and oxidative phosphorylation. A further result of anaerobic metabolism is the failure of the energy-dependent sodium-potassium pump, which maintains the normal homeostatic environment in which cells function. The integrity of the capillary endothelium is disrupted, and plasma proteins leak, with the resultant loss of oncotic pressure and extravasation of intravascular fluids into the extravascular space. Sluggish flow of blood and chemical changes in small blood vessels lead to platelet adhesion and activation of the coagulation cascade, which may eventually produce a bleeding tendency and further deplete blood volume. Clinically, patients with uncompensated shock present with falling blood pressure, very prolonged capillary refill time, tachycardia, cold skin, rapid breathing (to compensate for the metabolic acidosis), and reduced or absent urine output. If effective intervention is not promptly instituted, progression to irreversible shock follows. A diagnosis of irreversible shock is actually retrospective. Major vital organs, such as the heart and brain, are so extensively damaged that death occurs despite adequate restoration of the circulation. Early recognition and effective treatment of shock are crucial to prevent inevitable progression to this stage. A hemodynamically significant patent ductus arteriosus (PDA) in the first postnatal week can account for inadequate tissue perfusion in babies with birth weights below 1000g. This may be due to failure of a compensatory increase in the cardiac output secondary to myocardial immaturity and the ductal steal phenomenon, which accounts for uniform reduction in systolic and diastolic blood pressure. A significant decrease in systolic blood pressure occurs only when the PDA shunt is moderate or large, yet a decrease in diastolic and mean blood pressure can occur when the shunt is small. Shock remains a major cause of neonatal morbidity and mortality, although because it accompanies other primary conditions, specific figures for the frequency of shock are unavailable. Prognosis following neonatal shock is related to the underlying cause (eg, sepsis, heart disease) and the injuries sustained during the period of inadequate perfusion. Early recognition and treatment is essential to maximizing outcome in neonatal shock. Morbidity as a consequence of end-organ injury and organ dysfunction is similar. Frequent sequelae include pulmonary, renal, endocrine, gastrointestinal (GI), and neurologic dysfunction. Delayed diagnosis and treatment can lead to permanent neurologic sequelae such as cerebral palsy, epilepsy, and mental retardation. Schmaltz C. Hypotension and shock in the preterm neonate. Adv Neonatal Care. 2009 Aug. 9(4):156-62. [Medline]. Al-Aweel I, Pursley DM, Rubin LP, et al. Variations in prevalence of hypotension, hypertension, and vasopressor use in NICUs. J Perinatol. 2001 Jul-Aug. 21(5):272-8. [Medline]. Northern Neonatal Nursing Initiative. Systolic blood pressure in babies of less than 32 weeks gestation in the first year of life. Arch Dis Child Fetal Neonatal Ed. 1999 Jan. 80(1):F38-42. [Medline]. Gupta S, Wyllie J. Correlation of Non-invasive Systolic and Mean Blood pressure (BP) Measurements with Echocardiographic Haemodynamic Assessment. Third Congress of the European Academy of Paediatric Societies (EAPS). Copenhagen, Denmark. October 23-26, 2010. Laughon M, Bose C, Allred E, et al. Factors associated with treatment for hypotension in extremely low gestational age newborns during the first postnatal week. Pediatrics. 2007 Feb. 119(2):273-80. [Medline]. [Guideline] Dellinger RP, Levy MM, Carlet JM, et al. Surviving Sepsis Campaign: international guidelines for management of severe sepsis and septic shock: 2008. Intensive Care Med. 2008 Jan. 34(1):17-60. [Medline]. Wahab Mohamed WA, Saeed MA. Mannose-binding lectin serum levels in neonatal sepsis and septic shock. J Matern Fetal Neonatal Med. 2011 Jun 1. [Medline]. Kluckow M, Evans N. Superior vena cava flow in newborn infants: a novel marker of systemic blood flow. Arch Dis Child Fetal Neonatal Ed. 2000 May. 82(3):F182-7. [Medline]. Osborn DA, Evans N, Kluckow M, et al. Low superior vena cava flow and effect of inotropes on neurodevelopment to 3 years in preterm infants. Pediatrics. 2007 Aug. 120(2):372-80. [Medline]. Skinner JR, Milligan DW, Hunter S, et al. Central venous pressure in the ventilated neonate. Arch Dis Child. 1992 Apr. 67(4 Spec No):374-7. [Medline].